This week we return to QuantConnect for an article on working with Heiken Ashi data. We will cover how to use Heikin Ashi data in your strategy, take a look at some plotting options and also provide a simple strategy that can be used as a base for your own projects. This is not the first time we have touched this topic. Previously, we have covered working with Heikin Ashi charts on Backtrader. In that article, we also covered a little background/introduction to the Heikin Ashi candlestick and how to interpret it. Those introductory parts of the article are not really platform specific. As such, any readers who are new to Heiken Ashi candles would benefit from reading the first few paragraphs. QuantConnect’s approach to handling Heikin Ashi data differs from other platforms such as Tradingview and Backtrader. On QuantConnect we access Heikinashi data via an Indicator. This design decision makes a whole lot of sense. After all, Heiken Ashi candles are a derivative of real prices just like any other indicator. By contrast, on other platforms, Heiken Ashi data is delivered as a data feed. In other words, the OHLCdata is converted to the Heikin Ashi version of OHLC. When OHLCdata is converted, often beginners will end up with incorrect results and unrealistic expectations. This is because when Heikin Ashi prices are delivered as a data feed, the backtesting engine only has these prices for reference. In turn, this means that order fill levels and profit/loss calculations are based on prices which never existed. Note that this does not mean the other platforms are wrong or have issues. It just means that users must be aware of it and adjust their code appropriately. On QuantConnect the beginner does not even need to worry about this. The data will come through as a set of indicator values. All order fills and PnL calculations etc will always be calculated from the data feed using real prices! As we discussed, in order to use Heiken Ashi data on QuantConnect, we need to create an indicator. We do this in the same way as we created the RSI indicator in our first script tutorial. Fire up the API tree and you will find the HeikinAshi() Indicator is available right at the root of the tree. Users trying to plot Heikin Ashi candlestick charts might find themselves arriving at this article courtesy of Google. If that is you, we can at least save you some time from looking for a solution that does not exist. 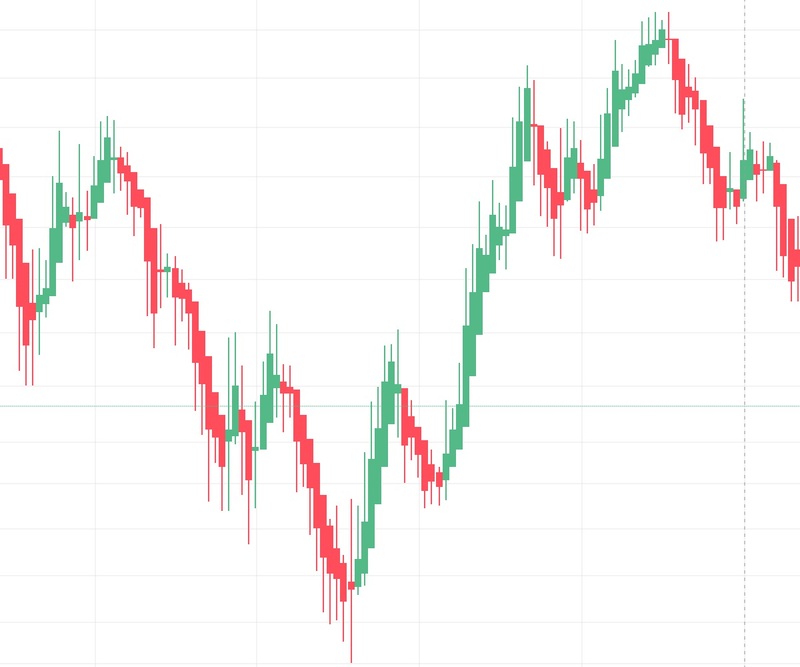 At the time of writing there is no support for plotting Heikin Ashi candles that look like this: Although QuantConnect does support creating custom charts, it is not a charting platform by trade. As such, users cannot expect to have Tradingview levels of charting ability. Having said all that, there are some things we can do to plot our Heikinashi data and four suggestions will follow. These are not the only options in the world but should provide a range of styles to consider. Whilst this is not one of the plotting suggestions, wherever possible, try to use the logging function (self.Log()). Unless you looking for visual patterns, you can verify everything you need to through logging. As such, this is a good time to start getting comfortable in the logs. Further to this, since we already know from our plotting tutorial that QuantConnect enforces limits on plotting, it is not practical to plot every data point in our algorithms. Our charts should be selected wisely and plotted only when needed. If you are a visual person and like to see charts in order to generate development ideas, then there is no harm in using a charting platform like Tradingview in conjunction with QuantConnect. Use the charting platform as your notepad and then come back to QuantConnect when you are ready to put an idea into practice! So without further ado, let’s move onto our suggestions. Note: All the suggestions shown below will be contained in the final strategy code. First, we can plot each data point from the indicator on a simple line chart. This will result in a chart which looks like this: Personally, I find that a little hard to read and would rather look at a log file. The next, option is to create a custom chart and set up a series on the chart that uses SeriesType.Candle. It should be noted though that this does not produce a OHLCcandlestick that you might be accustomed to on charting platforms. Instead, it produces something which more closely represents the equity chart. As you can see, each candle represents the change in price between 2 days. We can see this on the x-axis. It moves in 2-day steps. The third suggestion has been recommended in the community forums on several occasions and so it is worth mentioning here! With this method, we use scatter markers to plot the OHLCdata. #       either suggestion 3 or 4. The strategy is very, very basic. It simply buys when the Heikin candles are bullish (green) and sells when they turn bearish (red). As mentioned in the introduction, the code is intended to be used as a simple base to build upon. 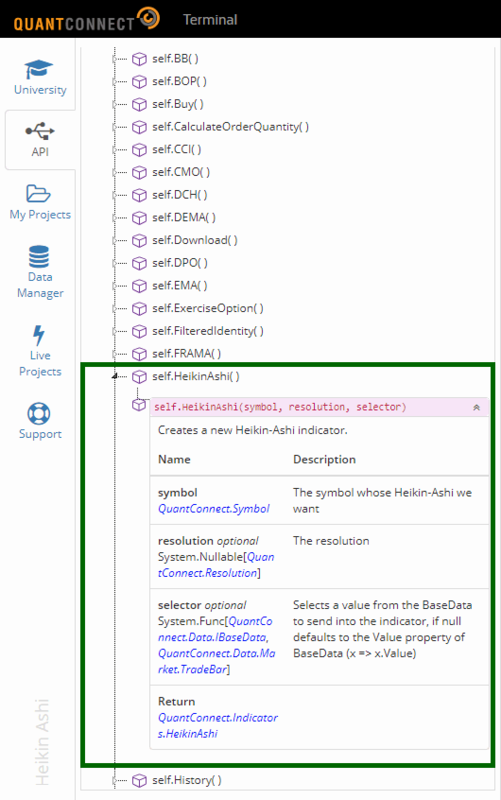 One general note that is applicable to the complete example code is that the Initialize()and OnData()methods (functions) have been coded in a way to support multiple assets. As such, if you add a second symbol into the line: self.Equities = ["AAPL"] Then the strategy will cycle through both symbols and create plots for each. It should be noted that due to the number of plots used in the examples, plotting limits will likely be reached. We are limited to 10 series plots per backtest. It is also for this reason that suggestion 1 is fully commented out. To practice what one preaches, some basic logging has been added to the example. 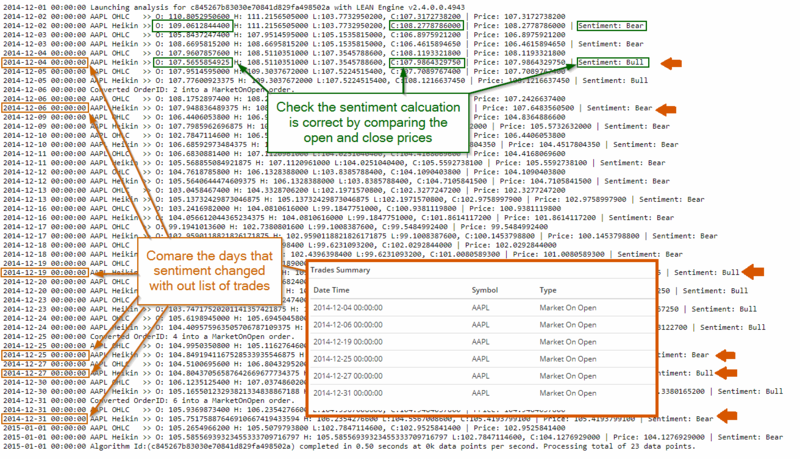 Here we simply log the real OHLC, Heikin OHLC and the candle sentiment. This is enough to compare the differences in prices and validate that our strategy is opening and closing positions in the correct places. It can be confusing at first because if you try to print the values using self.Log(), the values will be converted to a string and you will see them in the log. As such, you can be left wondering what the issue is. Save yourself some time and access the latest values through Current.Valueas shown in the example code. Whether we are buying/selling at the correct time. Double checking the earlier claim here that the LEAN engine always uses real prices for order fills. 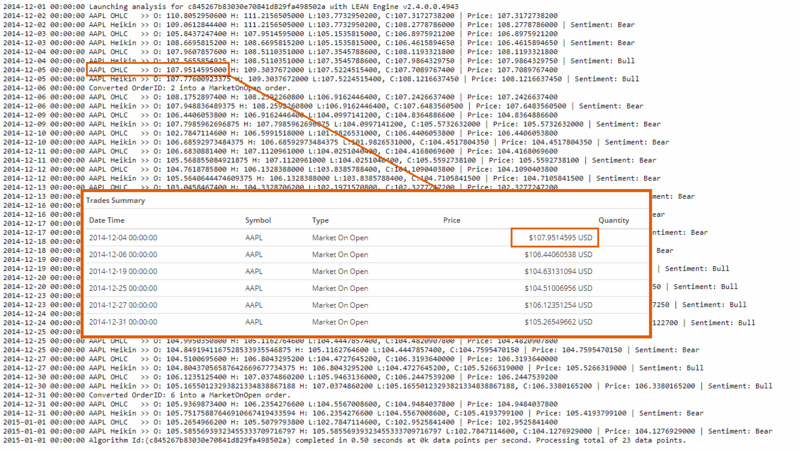 To check whether we are buying and selling in the correct places, we can study the logs and compare to the trade list: In the image above, we verify two things. First, that the sentiment is correct and secondly that only when sentiment changes we send buy/sell orders. Finally, we will verify our orders are being filled with real prices. Again we can do this by comparing our Log to the trades list. Here we can see that the trade is filled at the open of the following bar as expected. What’s more is that it is filled against real OHLC prices rather than the Heikin Ashi prices.